Welcome to Ruidoso’s friendliest wine and specialty food shop! The Cork & Kettle boasts a selection of the best New Mexico wines from a number of outstanding vintners, and has complimentary tastings on-site. You can purchase wine by the bottle or the glass. Enjoy an expertly prepared cappuccino or a delicious cup of tea. They feature unique New Mexico products including the finest pistachios and wine from Heart of the Desert, Bee Chama Honey, Los Poblanos Lavendar products, Red Rock coffee and many, many more. They have a vast array of other specialty foods including pastas, salsas, jams and jellies, chocolates, finishing sauces, and lots of other tasty treats to tempt your taste buds. They also offer cool and unique accessories to outfit any foodie or wine drinker and a fully stocked humidor for the cigar aficionado. The store has comfortable seating and space for small gatherings. 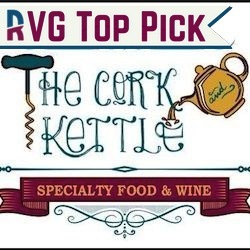 With a knowledgeable and friendly staff, The Cork & Kettle is your one stop shop for wine, gifts, and gourmet food items.